Episode 71 - Vyasa finishes his comforting storytelling, and then vanishes, leaving it up to Yuddistira to deal with breaking the news to Arjun that his son is dead. Arjun comes home expecting a party, only to find the camp in mourning over the loss of his son. He responds by swearing to kill Jayadratha by sunset tomorrow. The Kauravas find out about his oath and hastily make plans to keep the prince safe long enough for Arjun's vow to fail. 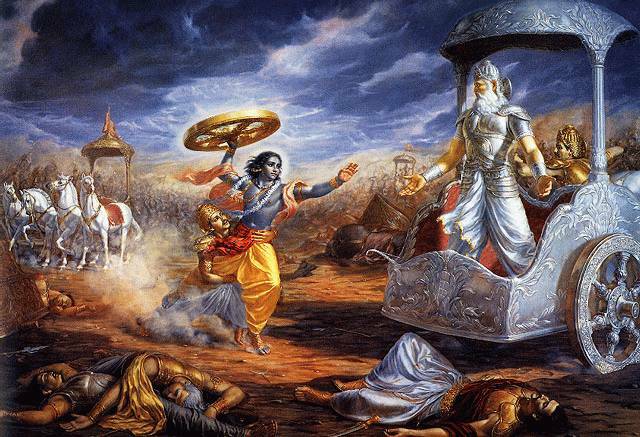 That is all it will take to get the Pandava out of the war! Now Arjun is a bit worried, but still he's got Krishna to help out. Even though the oath was sworn without Krishna's advice, he arranges a meeting with Shiva. Shiva provides a magic missile that should take care of everything. Arjun still has a long row to hoe-- we'll see how it works out tomorrow! I have recently subscribed to your mahabharata podcast via iTunes. Let me congratulate you for this great work. I am very happy to tune in to this podcast. I am in fact looking forward to the unabridged version! One thing to comment, though, the episode #5 is conspicuously missing! can you please air it ? once again , grat job. Thanks. I checked but I don't see a problem with episode 5, except that iTunes put it out of order when I made an update to the blog entry. Now it appears in the list in between episodes 67 and 68. I'm not sure how to make it go back to it's old spot! I have recently tuned into the Mahabharata podcast and must admit, I am truly hooked onto it. You have made it very interesting and your narration is great. There is a lot of material on the epic and you have done well to research and provide us with a single consolidated version. Unfortunately there is very little and authentic information ( to my knowledge), about the post Mahabharata period. Would you be extending your podcast into that period too? That would be very interesting and beneficial to all.